Children’s Birthday Party Ideas – Creative, Cheap & FUN! Welcome, Parents! You have found your way here because you’re looking for assistance with your child’s upcoming birthday party. If you’re asking yourself, “HELP! My kid’s party is coming up, WHAT DO I DO? !” I am here to help. First, let me reassure you. Unless you have groomed your child to believe the sky’s the limit, most kids are very satisfied with a modest party. I’m not talking NADA, but there’s no need to break the bank financing a party for a bunch of 7 years olds. As we just celebrated another successful birthday at home, I thought I’d share some helpful hints with others. After all, it takes a village to raise a child, and two heads are better than one, and.. well. You get the picture. Party Invitations. Ideas & The All-Important Wording. We all know the invitation says far more than what’s simply stated. It’s all about READING BETWEEN THE LINES. Right? Right! To save on stress and hassle, I offer these suggestions. If this party is to be KIDS ONLY, write Drop Off Time: and Pick Up Time: on the invitation, rather than the standard 11-2 PM. This important information conveys to parents that they are not expected nor encouraged to remain at the party (something very few parents relish anyway). If this is to be a KIDS & PARENTS affair, write on the invitation “Parents welcome!” “Parents may stay or drop off” or “Look forward to seeing you all” – something along those lines will get the point across. The invitations themselves can be anything – so get creative! We’ve done hand-drawn party invites, computer print-outs on festive paper, store-bought packaged jobs; it’s all good. The important thing is allowing your child to help in the decision making, if not the actual making of the invitations. Unless they’re too young to care, or completely disinterested, most kids like being in charge of their party to a certain degree. Let their individuality shine though the invites. FOOD. I am all for healthfulness, but bear in mind – this is a child’s birthday party. It’s supposed to be fun. All things in moderation, remember? You don’t want these kids so sugared up they’re flowing from both ends (sorry) but neither do you want them eyeballing the food with mistrust. This is not really the place for Uncle Iggie’s homemade tofu-garlic dip, unless your kid and their friends think that’s everyday fare. Stick to normal, kid-friendly foods. Like the perennial favorite: PIZZA! To keep costs down, buy it frozen from the grocery store, or better yet, a big box discounter like BJs. I spent $7.49 (with a coupon) for a 12 pack of Red Baron mini pizzas – both cheese & pepperoni – and the kids couldn’t have been happier. BONUS: because of the small size, there was less waste, the kids found them incredibly easy to eat, and Oh yeah, I cut them into quarters to speed cooling. No burned mouths at this party! FAVORS. I bought candy, party favors and prizes inexpensively at Target and the Dollar Store. Oh! And BJs too. Check the ends of aisles for clearance items. For instance, I found a bunch of plastic slinkies on sale for 48 cents a piece. That’s HALF PRICE or less. And I bought a big 100-piece bag of mini chocolate bars for half the cost at BJs (versus Target). But remember, there’s a difference between being economical, cutting corners in a way no one will notice, and just being CHEAP. People notice CHEAPNESS. They admire you when you are creatively thrifty. Think about it. The latter will earn you respect and imitation, the former costs more than it saves. Party Bags, Plates & Cups. You can buy these everywhere, and unless your child is wedded to an overarching “theme” – Elmo, Dora, etc. – save money by mixing & matching and looking for sales. I know some people swear by party stores, but I’ve yet to find one with better pricing than a big box discounter, unless you’re shopping for a massive group. And remember, these items are going to be consumed, recycled or thrown away. Don’t waste your money going overboard. Another hint: Get Creative. 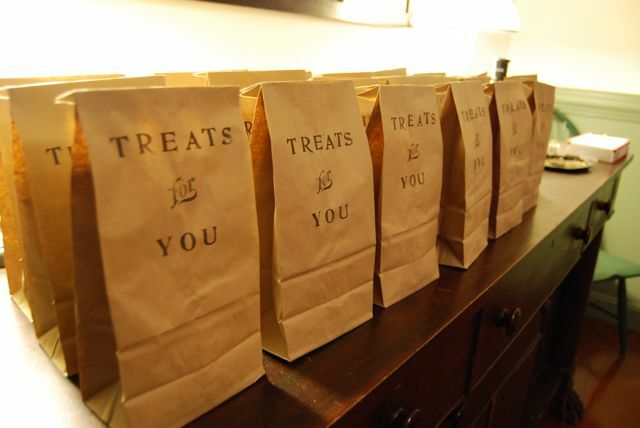 For both of my daughters parties this year, instead of purchasing commercial party bags, I used brown paper lunch sacks. Total Cost: $1 for 40. To fancy them up, I used a vintage stamp kit I found at a yard sale for $3 bucks. 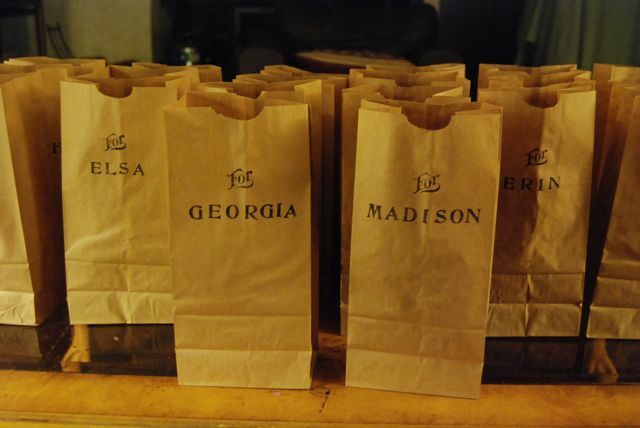 For my older daughter’s party – where I had all the children’s names beforehand, I made a personalized bag for each guest. For my younger daughter’s recent party, which had a Halloween / harvest theme, I made them a little different. I offer these purely to spark your own creativity. Use your imagination & go wild! Piñatas, Treasure Hunts, & Party Crafts. OH MY! Let’s talk party extras. Things that cost a little more, but truly make for an extra special occasion. We’ve done one or more of these at our parties and they’re always a big hit. 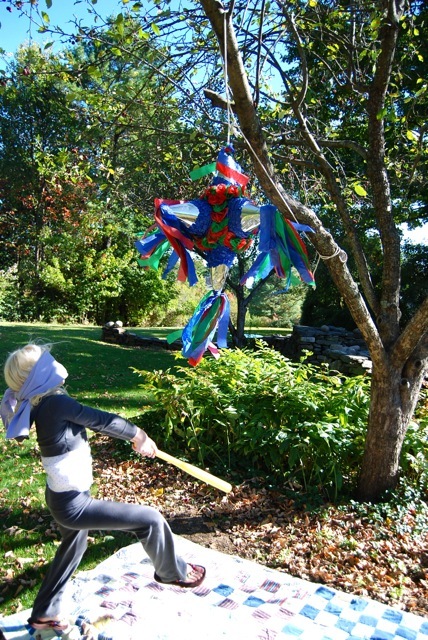 Piñatas. This year we found a fabulous piñata at Target on (you guessed it) CLEARANCE. It cost dollars less simply b/c one of the streamers was missing. Umm. Who cares? The thing’s going to get torn apart anyway. But just for show, I carefully trimmed an extra off another end of the piñata and shazam. Perfect-o. To fill it, DON’T WASTE YOUR MONEY BUYING THE PRE-BAGGED STASH. It’s expensive, the candy is stale, and it’s boringly standard. Instead buy candy in bulk (it’s cheaper and it’s fresh) – either from a place like BJs or the dollar store. To this add some dollar store trinkets, bead necklaces, erasers, etc. A WORD OF CAUTION: remember this stuff is going to come flying out at a group of children. Don’t buy things that could poke or cause harm, such as lollipops or pencils, and stay away from things that could otherwise break or get damaged in the process. Treasure Hunts. In a similar vein to the annual Easter egg hunt, try a Treasure Hunt at your next party. It can be as simple or elaborate as you wish, from opening the backdoor and saying Okay Kids, go find the treats, to creating fancy pirate type maps with clues, to..?? Let your mind wander. Just remember weather conditions. DUH? Yes, I know, but it’s less appealing to hunt in the cold and rain. Think ahead and you’ll always be prepared (and look great in the process – *wink*). neither was a huge investment, but provided something very fun and memorable for the kids to do at the party AND take home. 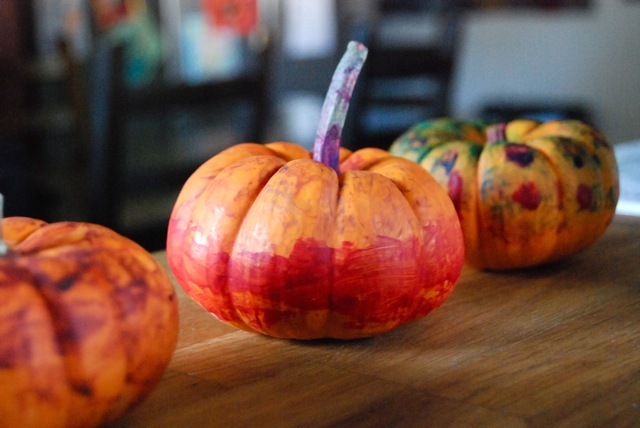 You could do a craft that incorporates several things – like food and fun. Make your own sundaes are always popular. You can have them draw pictures, or paint, or make something with dough. 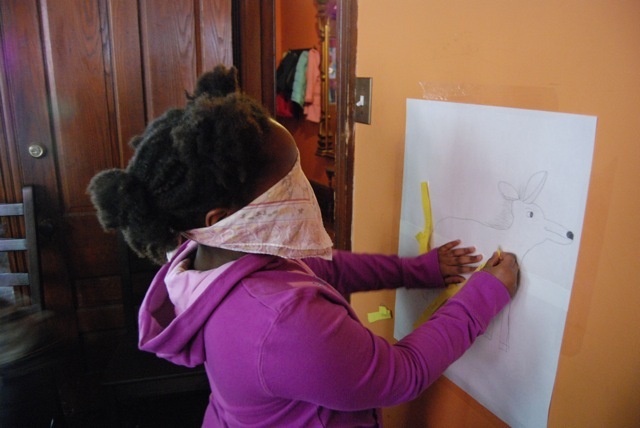 Even if it’s just decorating blown up balloons with markers, the kids will have fun. And you will too. There is nothing better than spending quality time with your child, especially on their birthday. And you do not need to spend a lot of money; just be creative. Games with PRIZES. I don’t care what mamby-pamby parents have to say – Kids like Prizes. I am not steel-jawing these kids into believing YOU MUST PERFORM!!!! to earn a prize. No way. But I’m also not depriving them of the good feeling a win can inspire, either. Keep the games simple and fun, make sure you have enough prizes so that every child has a chance to win, and afterward, give the kids who didn’t win anything a prize for trying. Everyone leaves happy. Sure, some kids might have won more than their peers, but frankly, that’s life. And no one goes home empty handed. Keep the games age appropriate, or you risk dismay (huhhh??) – or worse, boredom. Here is a BIG FAT LIST of suggestions (you are welcome). Good news? The party will be over before you can try them all. And there’s no need to buy much if anything to play these. Make your own Pin the Tail on the (Whatever). Use a pair of rolled up socks or a stuffed animal if you don’t have a bean bag. Any questions about game rules, leave a comment below and I’ll be happy to elaborate. Or have I missed one? Comment & leave your own suggestions as well. A Friendly Reminder. Your kid’s birthday comes but once a year, don’t waste it stressing over the party. A bunch of kids couldn’t care less that you haven’t finished installing (insert whatever mindless item that’s bothering you). Neither do they care if your silver is spotless. Run the vacuum over Foofie’s furry mess on the carpet, wipe down the counters they’ll be eating on, and relax. If you feel overwhelmed being on your own with all the kids, ask other parents to help. A parenting pro? Invite kids only and 1) your fellow parents get a break, 2) you only need to shell out for children, and 3) you can spend time focusing on making your child happy – rather than entertaining a bunch of adults and worrying what they’re thinking. YOUR CHILD’S BIRTHDAY COMES BUT ONCE A YEAR. This party is for your kid, NOT YOU. Don’t forget that. And don’t sweat the small stuff, b/c really – it’s all small stuff. My friends are the BEST. THANK YOU, everyone, for your incredible expressions of sympathy. I cannot tell you how much it cheered me up. Seriously. you guys are the BEST. The past few days I’ve felt like something on the bottom of a shoe, but today the sky is blue, the birds are singing and all seems right again w/ the world. It stings to look out the back window and see Prudence’s lonely hutch there w/out her. But I made arrangements to pick up her ashes in a couple weeks, and returning her to the place she loved will bring closure to the circle. I didn’t realize it would take so long to have a private cremation for a rabbit. But for only $85, who’s complaining? That wouldn’t even cover my toenails at a funeral parlor. The insurance companies are handling the accident claim. It’s good to know we’re getting something out of allll thatt moneeeyyy spent on insurance. SO. I have been unbelievably busy the past couple weeks, and feel like I haven’t been blogging, or even reading blogs. I have no time. NONE. I’m only on the computer b/c I snuck away. My daughters are now both home for the summer. The next 11 weeks. I counted. I DON’T CARE WHAT SHE DID. WOULD YOU PLEASE STOP TOUCHING ME. YES, I HEEEEARRRRRD YOU. THAT IS THE THIRD TIME YOU ASKED> I SAID WAITTTT. STOP IT. NOW. I MEAN IT. CUT IT OOOOUUUUTT. NOOOOOW. PICK UP YOUR [insert item]. ICE CREAM IS NOT BREAKFAST, and BY THE WAY DID you have to leave it out on the coffee table??? ARE YOU SLOW?? Did you not think I would be pissed that a) you were eating ice cream at 6 o’clock in the morning? ?, and b) THAT YOU LET IT MELT?? all over the effing table. next to a PILE OF CHIPS. You two stink at this. You have to be SNEAKY. SNEAAAAAAKKKKY. That means putting it ALL BACK before I come down here in the morning. But no…. Yes, I am going a little insane. For some reason, these kids want to be entertained 24/7. They think I am Julie, your cruise director from the Love Boat. I guess it’s my fault. We have been renting the first season of Love Boat episodes from Netflix and MAN, my daughters are HOOKED. My husband has given up. He was patient for a little while, as long as I plied him with a steeping quantity of wine and/or whiskey, but no more. He says he has reached his Love Boat limit. Granted, the shows are a little formulaic. And YES you do know what is going to happen as soon as the passengers board. The acting’s bad. I know it’s not PBS. BUT He just doesn’t understand. I spent hours watching the Love Boat as a child. It was **MAGICAL**. ANYWAY, John graduated Saturday. and now is the proud owner of a masters degree in Information Science. We’d made plans to attend commencement, but at the very last minute John changed his mind. so we went to the Borgata instead. I have to say, WAY TO GO JOHN! a MUCH more pleasant way to spend a Saturday night. After stuffing our faces at the Buffet, John & the girls hit the beach and Mom-Mom & I hit the slots. LO & BEHOLD, those sneaky tricksters at the Borgata played a shell game w/ my secret luckiest winningest machine and MOVED IT. Damn! Oh well. I won $47 on another machine, and John’s grandmom won $94. I like winning money. Almost as much as being sent UNBELIEVABLY MARVVVELOUS PRESENTS IN THE MAIL when I least expect them! WOW. 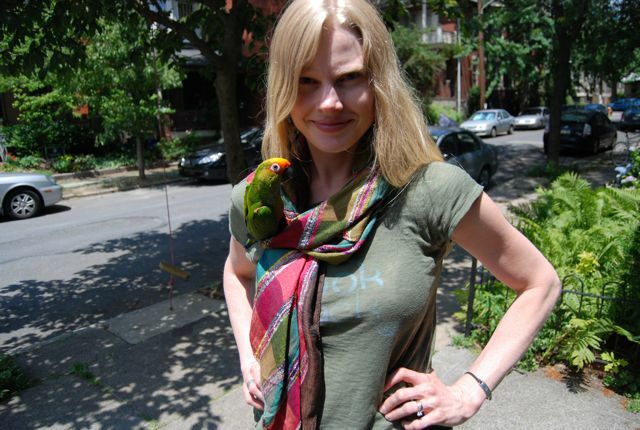 JUST LOOK at this absolutely STUNNING scarf I rec’d yesterday from my brilliant pal Tracey. Who soooooo totally ROCKS!!! Thanks so much Trace!!!!!!!! As you can see, Kiwi has already made herself comfortable. I LOVE IT.